⚠️ ISSUES WITH THE TOKEN SWAP? READ THIS! - send us an email at [email protected] ( topic: I HAVE A PROBLEM WITH SWAP) with exact description of the problem that you have faced. We will get back ASAP, all the problems will be solved so stay calm! ⚠️ Please beware of scammers. Scammers impersonate admins by using our profile photos. A real Admin will NEVER privately message you first and will *NEVER* ask you to send money anywhere! We’re excited to announce that we are going to be a part of the massive eMerge Americas (http://emergeamericas.com/about-us/) expo at the Miami Beach Convention Center from the 23rd through the 24th of April. This is a premier technology event connecting the Americas and exposing us to a wealth of potential partnerships. We are among good company, as sponsors include the Knight Foundation, Medina Capital, Greenburg Traurig, A-Rod Corp, Miami-Dade County and the Miami Herald. Interview with David Carp - ex-CPO for Kia Motors America. Join our announcement group, https://t.me/VINChainOfficialA... all the news will be published here, so stay updated! In this video we summarized the results from this week. All of the achievements and new developments of the project. Please note that not enough people have done the tokens swap so please make sure to get that done. Our tech team has been working around the clock to solve everyones issues, so please try doing the token swap again if you have not done so recently. The sooner you do this the better, so your tokens could become unlocked. Also we have other special news in the video, so make sure to check it out! Starting from this week VINchain will release a weekly update on our developments, this way you will always be updated! As this is our first update, let us know what you think, we’re happy to hear feedback from our valuable community. Tokens will be unlocked at the end of the week! As many of you already know, we have been waiting for the majority of the ICO participants to complete the token swap. Right now we can say that not enough people have went through the token swap, and so for those of you who have yet to go through the swap - Please do so now! We cannot wait any longer - and we will unlock the tokens at the end of the week! If you don’t swap now, you will have to pay a commission later!!! Currently you can still swap your tokens without paying a commission. Once the tokens are unlocked at the end of this week, you will have to pay a transaction fee in order to complete the tokens swap. Please hurry and do the token swap now! Having trouble with the token swap? Don’t worry, help is just one message away! Reach out to us on Telegram https://t.me/vinchainio with your questions and our friendly admins will be happy to assist you. If you don't swap your tokens, they will be locked and un-tradable! If you do not swap your tokens as soon as possible, then your tokens will be locked and un-tradable! You will not be able to participate in trading your tokens on exchanges! - so please complete the token swap ASAP! VINchain wallet release at the end of the week! After the tokens are swapped and unlocked they will reside in your VINchain wallet. The wallet will officially be released this week. Please remember that the security of your wallet is guaranteed by your private key, so ALWAYS make sure to keep your private key safe! - We cannot recover your private key if it is lost or stolen! Q) What is a token swap? A) As you all know we will be using our own blockchain (not Etherium) and our own VINchain wallet that you can use to store your VIN tokens! In order for our tokens to be stored in your wallet, they first have to be converted from the Ethereum based tokens that they are now, into VINchain blockchain compatible tokens. This is known as a token swap. Q) Why is a token swap necessary? A) You have to go through a token swap so that your tokens become tradable, transferable, and usable. Q) Who has to do the token swap? Interview with our CEO Alex Miles and Matt Carpenter - Chief Financial Officer of Audi of America and Audi Canada. Matt has a breadth of experience managing in the automotive industry. In this interview he is talking about his interest in the VINchain, his passion for the automotive industry, and his aim to create a better future! Matt describes the future of the project and how his participation will open new doors, give new perspectives, and opportunities for us! We are glad to have Matt on the team - a person who is as equally enthusiastic about VINchain as all of us! This is our second weekly update and we are glad to keep everyone updated about the progress this week! Your feedback is important to us, so please let us know what you think. We are thrilled to announce that VINchain is going to participate in the Annual Summit that will be held from May 8-10, in Grand Cayman, Cayman Islands. At this event, we will have the opportunity to be a part of the most crucial conversations in cryptocurrency, policy and the global "token" economy. Also, we will create important deals and partnerships, as so many valuable people and companies will be a part of this event — we will get the chance to introduce them to VINchain. We have an announcement for you! As you all know, our system will be working on our own blockchain, which is why we have been asking you to complete the swap! The swap is on pause for now because we are calculating the percentage of people who have done it. Everyone who has completed it will have their tokens unlocked in their VIN wallet (you will get the link soon). We have a wonderful announcement for you. As many you are aware, the swap is stopped for now. We have been waiting a few weeks for people to go through the change, but we can no longer delay. Right now, we are in the process of switching to our own blockchain. On monday we will unlock the VIN tokens of people who have gone through with the swap, and they will receive them in their new VIN wallet. After this period, all who haven’t yet had the opportunity to make the switch will have the chance to do so. When this becomes available once more, we will send new instructions on how to make the switch! We have decided that the swap will be for FREE for everyone. There are only 1500 people left who need to make the swap, and VINchain will cover the transaction fee expenses. Please follow our announcements next week for new instructions and make the swap as soon as you are able. This is the third week of our regular news release, where we inform you about everything that happened in the world of VINchain over the course of the last week. We are always interested in hearing you opinion so please let us know any feedback that you guys might have. We have an amazing news for you. We have joined The Automotive Service Association (https://asashop.org/ ). Since 1951, the Automotive Service Association (ASA) has been the leading organization for owners and managers of automotive service businesses that strive to deliver excellence in service and repairs to consumers. We’re happy to announce our newest adviser, Jon Arnett! We have awesome news for you! Our team has been working hard to make it happen, and finally we are glad to announce that our wallet is ready and you can see it here (https://wallet.vinchain.io ). In order to start using your wallet you need to activate it. The guide is here (https://medium.com/@vinchain/i... ). This guide is intended for those who have went through the token swap process already. If you have yet to complete the token swap, don’t worry – we will publishing a new guide with all of the instructions simply laid out for you really soon. As many of you know we have published the VINchain wallet yesterday and made it accessible for all of you. Everyone who has completed the swap earlier can activate their wallets and officially use their tokens. Also you can see the wallet in your account on our website, the wallet is available for both windows and mac. Right now we are opening the swap for the people who haven’t completed the swap before. 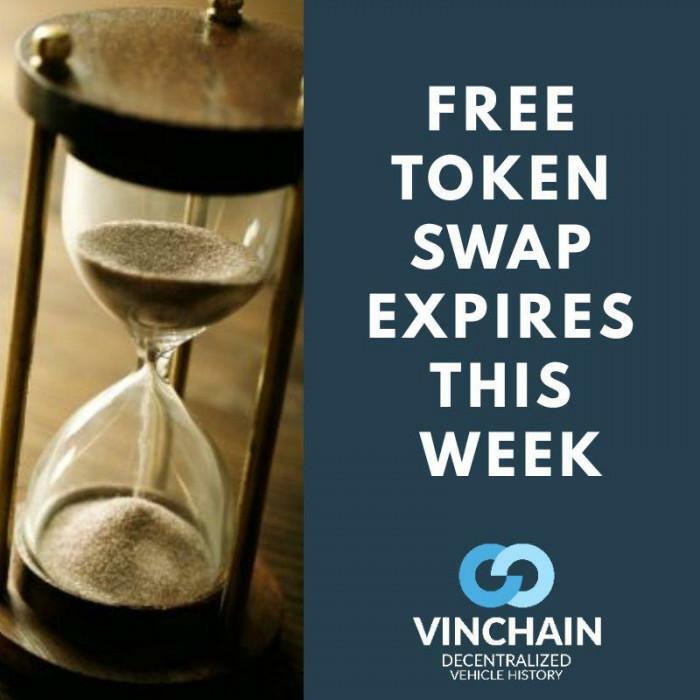 You can see the link to the swap here (https://vinchain.io/account/sw... ). While you go through the swap you will create a VINchain public wallet key and a VINchain private wallet key. KEEP THESE KEYS SAFE!!! :) - Just like any other keys in the world of crypto. You will need these keys to use your wallet. Also our blockchain is ready and you can see it in GitHub (https://github.com/VinChain/VI... ). Its open source and publicly available for everyone to analyze and see how everything works! We are extremely happy to announce that we are taking part in the prestigious Emerge conference (https://emergeconf.io) that aims to discover and showcase emerging technologies and tech hubs. It will be held in Minsk, Belarus on the 17th and 18th of May. Our Belarusian team will be in attendance, so we would love for you to come and meet us there. If you will be nearby, don’t hesitate to say hello! We are expecting to get inspired, learn more of the best practices for building tech products, hear founder’s stories, build partnerships, find new paths for our project and spread the word of VINchain. There will be many talks on VC & ICO startups and investors, entrepreneurship, accelerator opportunities, marketing and sales. We are looking forward to sharing the revolutionary developments VINchain has to offer.